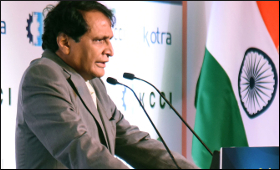 Commerce Minister Suresh Prabhu recently met top Russian business leaders and industrialists and invited them to take India-Russia bilateral trade to a new level. During his visit to Russia, Prabhu addressed top CEOs at a reception of the All-Russia Business Association "Delovaya Rossiya" (Business Russia), which is a Union of next-generation Russian entrepreneurs operating mainly in the non-commodity and processing sectors. He spoke about the immense growth potential in the business ties of the two countries and the way to forge new partnerships between Indian and Russian businesses. The Minister also held bilateral meeting with Yury Trutnev, Deputy Prime Minister of Russia. Discussions took place on areas of cooperation between India and Russia to strengthen bilateral ties for economic growth. The Minister also interacted with the Governors, Vice-Governorsss and Representatives of the Russian Far East Regions of Primorye, Yakutia, Sakhalin, Amur, Magadan, Kamchatka, and Khabarovsk. Discussions were held on possibilities of mutual cooperation in sectors like mining, agriculture and tourism. He invited the Governors of the Far East Regions to lead business delegations to India and explore partnerships with Indian businesses. Prabhu also held discussions on enhancing bilateral trade and investment between India and Russia with Denis Manturov, Minister of Industry and Trade of the Russian Federation and Aysen Nikolayev, Governor of the Sakha Republic. Suresh Prabhu met with Maxim Oreshkin, Minister for Economic Development of the Russian Federation. The two sides held talks about further strengthening economic ties between India and Russia and the way forward in developing synergies for mutual growth. On the last day of the three-day visit, the Commerce Minister participated in the session of “Timber in the Russian Far East: Increasing the Industries Economic Returns”. Discussions were held on how to explore possibilities of working together for mutual benefit through this resource in a sustainable manner. India is one of the world’s largest importers of timber having imported over 3 mn cubic meters of topical logs in 2016 and 346,000 cubic meters of tropical veneer.